Cultivate What Matters – Powersheets and What You Need To Know About Them! – create trust daily. In my previous post, I shared a little bit of how I am prepping for 2018 and a few things that worked for me in 2017. It is true, my weekly planner has helped me keep up with my crazy day to day and juggling life. BUT – I have to tell you about these Powersheets! You don’t quite understand, and I hope to help with that soon – but these Powersheets have been a GAME CHANGER for me this year. From the beginning, the Powersheets are set up to help you focus on setting goals that matter to you. Meaningful goals that encourage you and help you focus on what is most important. I admit, last year the prep sheets were a bit intimidating in the beginning – but every year they get more simplified and FUN. The thing that really helped me through the prep work was to just take my time. The first day I did the “What Fires Me Up” page and adding photos of my sweet family just filled my heart with joy. In a day or so (when I had some time to myself) I pulled my Powersheets back out and started on a few other pages. Some days I did more than others, but taking my time really helped me be thoughtful with what I wrote down and helped me not to just rush through just to do it. I started my prep work on November 25 of 2016 (I know this because there is a handy spot for me to write this down) and had them all finished up for January of 2017. The prep work is SUPER helpful for getting you in the right “mental space” to set some intentional goals. I don’t mean general goals like “Lose weight”, but focused and meaningful goals like “Go on family adventures” or “Go to 3 of 4 Sundays of church per month”. After you brainstorm some goals and have your 10 chosen, they help you dig into each one walking through action steps on how to actually achieve these goals throughout the year. Setting goals is fine and dandy, but its the putting them into action that is the GAME CHANGER! After all your goals are broken down to the core and you have a real life idea of how to make these special things happen for you on a day to day instead of a “someday” plan….then you get to do your Tending List. I LOVE THE TENDING LIST. I will do these Powersheets every year just because this Tending List rocked my 2017. I fill mine out at the end of the previous month and I hang it right on my fridge so I see it and actively keep it up every day. On the Tending List you have things you’d like to accomplish or make progress on over the course of the month. I sort my monthly, weekly, and daily goals out and write them on in. I actively do the Daily goals each day, and then for the weekly and monthly goals I just check in over the course of the month about once a week. I don’t have any expectation, I could honestly check in at the end of the month if I needed to, but actively looking at the goals that are important to me has really helped me focus more on what matters to me personally. I’m going to just go ahead and let you know, I have to take thyroid medicine every day. I have had to take this for over 6 years now and until this year, I was really really bad about taking it consistently. My medicine has to be taken first thing in the morning with nothing but water and I can’t eat (or drink anything else except water) for 30-40 minutes after I take it. I am supposed to take it at generally the same time every day as well. Ya’ll this is SO HARD! I have 3 (soon to be 4) kids and my days get crazy and are rarely consistent enough to keep up with this. But now I can proudly say (yes I am very proud of myself) that I take my medicine 99% more consistently with this Daily Goal on my Powersheets. I can’t go into the fridge without seeing my Powersheets in my face and reminding me – “Oh! Let me grab some water and go take that real quick.” Checking it off each morning is also helpful when, in a few short hours, I can’t remember if I did actually take it or not…. (struggle is real). That’s just a small (for others, but huge more me) example of how I use the Tending List in my day to day. Other things I have written in my Daily Goals section are things like: morning prayer, Bible Study, tidy up, read to kids, and then when my kids are sick I use it to track giving them medicine – surely I am not the only one who makes it halfway through giving a round of antibiotics in the mornings and then on a morning I wake up late ended up skipping a day! Some things I write in my Weekly Goals are: Go to church, exercise (hey at least once per week is a huge improvement from never), date night, and rest/”me” time. My Monthly Goals are a little more open and usually include more work related goals. This section doesn’t have check marks, instead it has a progress bar to just acknowledge that I actively put some effort into working towards these goals throughout the month. I love making my Tending List colorful and using the Cultivate What Matters – Stickers to decorate them! Doesn’t hurt to have something cute and useful to look at throughout the year 🙂 I also use the stickers in my ReFresh Weekly Planner and I store them in the front pocket of my planner when I am not making all things pretty. At the end of the month, I started stapling my old Tending Lists onto the monthly divider of my Powersheets so I can keep them all in one place in case I’d like to look back on them. I also took some old ribbon I had and tied it into the top coil of my Powersheets so I could easily go straight to the month I am on when I come back to start my next Tending List or the seasonal goal refreshers. Overall, the GAME CHANGER part for me with the Powersheets, has been how they help me focus on what is important to me. If potty training my daughter is important to me, they help me do that…if having weekly dates with my husband is important to me, and they help me do that…if sharing God’s Word with our clients is something that is important to me, I can focus on making that happen! The key is, they help me do these things because these things are already important to me, and having them written out and visible just reminds me how much they mean to me! 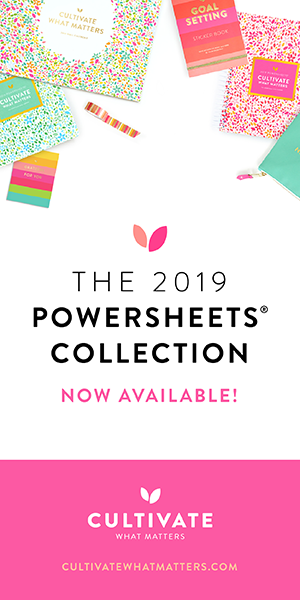 I have a few affiliate links listed below if you would like to check these gorgeous Powersheets or some of the other accessories out for yourself. But I would also love if you took some time to leave me a comment and tell me hello, or let me know if you think these might be a blessing for you and your family as they truly have been for mine. If you have previously used the Powersheets, I would LOVE to know (and love for other readers to read) how they have helped you personally? 1- If you are interested in learning more about the Cultivate What Matters – Powersheets or order your own, you can do so here! 2- You can snag your own set of cute stickers Cultivate What Matters – Goal Setting Sticker Book right over here! 3 – If you are interested in checking out, or getting your own 2018 ReFresh Weekly Planner by J.Lynn Designery, you can do so here! Love your blog post so inspiring. Goal setting is such an important thing that I often forget to do.